White card with mom, dad, older sibling and new baby sitting on the couch watching television. Couch has pink and green swirls on it and wallpaper has pink rosettes. 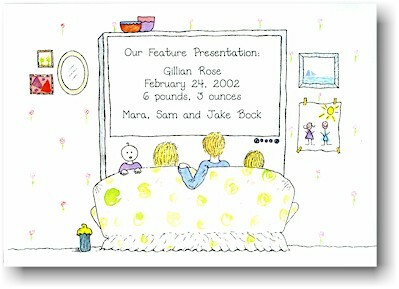 White flat card with baby dressed in purple peeking out from behind a couch that has pink and green swirls on it.